In November 2012 the hidden railway history of the village was brought back to life with the unveiling of a new display board that includes old photographs and digitally-created images snowing how the station looked. Rolleston Parish Council commissioned the board, which marks the former location of the village railway station, closed in 1949 and demolished in the 1960s. 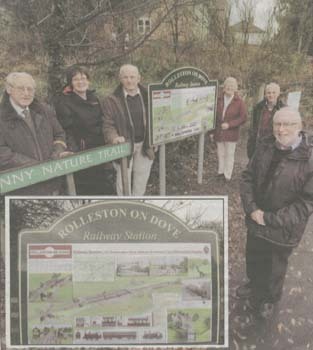 The display, which stands at the entrance to the Jinny Nature Trail, following the route of the former railway line between Rolleston and Stretton, was designed by village railway enthusiast Clive Baker. Parish council member Bryan Chinn said the authority hoped to enlist volunteer help to unearth some of the remaining features of the station, including its platforms, now buried under decades of undergrowth. He said (Burton Mail article 22-11-12): "Rolleston was quite an interesting station with an interesting history and a few people in the village asked us to look at exposing some of its original features. Our aim is to use the sign to publicise the fact that a large station did exist in Rolleston and to motivate volunteers to help reveal the remains of the buildings at a later date." Anyone who would like to volunteer is asked to call parish council clerk Heidi Light on 812538. The picture shows railway enthusiast Clive Baker (front) with Alan Partington, Heidi Light, James Toon, Beryl Toon and Bryan Chinn. The sign can be seen in more detail here (pdf document). The Jinny Trail was part of the railway line between Rolleston on |Dove and Stretton, which was originally operated by the North Staffordshire Railway Company, and at the time it was closed the local train called theTutbury Jinny was well known in the area. After proposals to turn the line into a rubbish tip were abandoned, the local council bought the line, and today Stretton and Rolleston Parish Councils own the Jinny Trail parts within their respective boundaries, and hold joint management meetings. Stretton Parish Council is currently improving the entrance at their end of the trail, and Rolleston residents have asked their Parish Council to consider improving the entrance at their end by clearing undergrowth and providing an informative sign commemorating the railway connection by illustrating the original Railway Station. Local graphic designer and railway author/enthusiast Clive Baker has researched the subject, provided advice and has created original artwork for the sign. The result is an imposing and accurate representation of the original station, bridge, signal box and associated buildings which originally comprised Rolleston on Dove station. Rolleston has a history of voluntary community involvement in more than a few local projects, and it is hoped that the erection of the sign will motivate similar help with the proposed improvements which aim to reveal some remains of the station and improve the entrance. An ex-Rolleston woman has beaten off competition from acclaimed authors Jeanette Winterson and Simon Armitage to scoop a £10,000 literature prize. 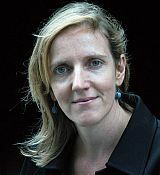 Jean Sprackland, previously Lockley and formerly of The Lawns, won the Portico Prize for her debut non-fiction work Strands: A Year of Discoveries on the Beach. “I was just staggered, really, and, of course, delighted. It was a complete surprise,” said the 50-year-old, who received her award at a dinner attended by 300 people at Manchester Town Hall. (Read the full Burton Mail article here). A special event was held in the village on Saturday 17 November to celebrate the tercentenary anniversary of an historic building. Rolleston-on-Dove's famous almshouses have stood in the village for three centuries and, as well as a celebration, the event was held to mark the beginning of an appeal to raise £600,000 to fund the site's refurbishment. East Staffordshire's mayor Len Milner was among attendees at the event, held at St Mary's Church. 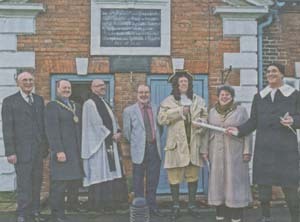 The picture shows (left to right) chairman of the almshouses trustees Tom Martin, Mayor Len Milner, Rolleston rector the Rev Ian Whitehead, Rolleston family genealogist Ken Rolston, Arnold Burston (as William Rolleston), mayoress Jackie Milner and trustee member John Phillips outside the famous almshouses in Burnside. Needwood, a book by Rolleston born Miles Richardson, entered Amazon’s Top 5 bestsellers in British Travel writing in October. Needwood takes a simple journey into the local countryside around Rolleston and pulls out of it, a universal story about our connection to nature and the landscape. Rooted in the long tradition of British nature writing, Needwood is a reflective celebration of the joy that can be extracted from ordinary things in the natural world. Within the 220 short walks there are several simple trips around Brook Hollows, to the Dove, through Anslow to Needwood and excursions to Devon, Wales, Yorkshire, Northumberland and the Isle of Mull. 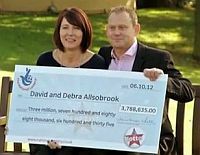 Married Stretton couple David and Debra Allsobrook had some Champagne to celebrate their £3.8 million lottery jackpot at the Spread Eagle in Rolleston, where they had a chance encounter with Wendy Slater, the shop assistant, who sold them their lucky ticket. More details can be read in the Burton Mail article here. Having earlier cleared the land of overgrown bushes and trees a small group of volunteers turned out on Saturday 22nd September to help plant the Jubilee Orchard at the top of Beacon Road. 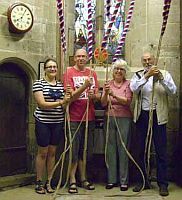 Pictured (left to right) are Amy Couchman, Ian Whitehead, Joan Morris and John Morris who rung the church bells on 27th July from 8.12am to 8.15am for the 12 hour count down to the opening of the Olympics. Rolleston on Dove Parish Council is celebrating after being named as second prize winners of the Daily Mail’s Spring Clean for the Queen competition. In the run-up to the Diamond Jubilee, the national newspaper ran the campaign to encourage communities and businesses to ‘spring clean for the Queen’. Among the improvements made in Rolleston included repainting the front roadside railings of the primary school, pruning trees, and replacing a wooden weir on the brook along Burnside. An allocation of the money will be going towards a community orchard which is being created to commemorate the Queen’s Jubilee. 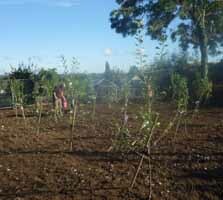 The Orchard will have open access and will host 40 fruit trees, including Victoria Plum, Braeburns, Apple, Conference Pear, Sweet Cherry and Bramley Apple. The trees have all been sponsored at £10.00 each by local residents. 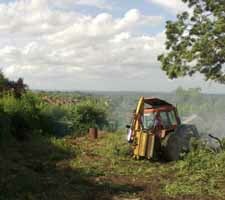 The Parish Council submission along with photos can be found here. The Burton Mail also ran an article. This roadshow event delved into village's fascinating history. Read more about it in this Burton Mail article. Rolleston Scout Group held its 35th annual parade from The Lawns on Sunday 13th May - with a special London 2012 theme. More than 1,000 people attended the event held at the Scouts HQ and Scouts Leader Graham Jacks said the event was a great success. Tom Starbuck was presented with the Rollestonian of the Year Award 2011 at the Annual Parish meeting on 23 April 2012 - the day after completing the London Marathon. Despite declaring “never again” after finishing the 2010 London Marathon (having raised over £10,000), he changed his mind, and this year both his wife Becky and himself ran the London marathon to once again raise funds for Birmingham Children’s hospital. This is the hospital where their daughter, Evie, spent her first five months of life. Their fundraising will go to the Neonatal Surgical Ward whose dedicated staff continue to go above and beyond the call of duty for every family who needs them. This is the fourth time he asked for sponsorship money, saying "but this will be the last time I attempt a sponsored run because my knees are telling me to stop!! The people of Rolleston have been truly amazing since Evie’s arrival in December 2008, not only in fundraising, but also in support and kindness. We appreciate every penny we raise and are well aware of the generosity in this current economic climate. Thank you once again for all your help in our efforts to give something back to the hospital. As always we will be collecting sponsorship money in the shop or visit our website to donate on line at http://justgiving.com/Tom-and-BeckyStarbuck." (over £6,400 .... as 05-05-2012). This year the clear winner, with a remarkable 99 points was Mrs B. Bolton - Market Harborough. Second with 98 was Mr M. Staley – Alcester. Four entries scored 97 points, with the Bush Family winning the draw for third place! This work of art is by John Underhill. Definitely the largest #snowman in Rolleston-on-Dove today (Sunday 5th Feb)? A local resident has set up an unofficial twitter account for Rolleston and it is well worth a look. Already some good pictures of the snow. 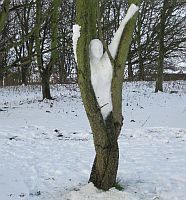 Did you build a snowman - and was it bigger than this?